Managing tenant energy billing may seem daunting, but it doesn’t have to be difficult. With new, high-quality multi-circuit metering technology, you can accurately measure tenant energy consumption, bill them for their usage, and help them to use less energy (which can ultimately lead to lower costs). But there are many different types of metering technology out there; how do you select a metering solution that is right for your tenant metering application? While all metering and billing systems may seem to offer the same benefits, be wary of simply choosing the first option you find or opting for the cheapest system. You need an accurate, reliable system that is suitable to the exact specifications of your application. There are a few considerations you should make while considering your ideal solution. If you’re going to start billing your tenants based on their individual energy consumption rather than splitting the bill evenly, accuracy of the complete metering system should be top of mind. Your metering solution must be able to reliably report on your tenants’ actual consumption and bill them accordingly. An inaccurate system will hurt you and your tenants: if you bill them too little, you’ll be making up those costs. If your tenants feel you’re billing them too highly, they may not decide to renew a lease or contract. The amount of real estate your tenants occupy. Do some tenants rent multiple floors? Do some share space with other tenants? Your system must be able to add and subtract consumption based on the acquired tenant space. Billing for shared space. If your system only charges tenants for their individual usage, you may be losing money paying for energy consumed in shared spaces such as hallways, restrooms, or elevators. If your system doesn’t take these into account and charge tenants proportionately, you’ll be stuck with those costs! Additional charges. Your system needs to allow for additional tenant charges, such as a monthly billing fee. Your meters and current transformers must be accurate enough for revenue considerations—if you don’t trust your system to measure energy consumption accurately, you can’t use it to make decisions about your building. There are also official standards of accuracy that you should consider when selecting a metering solution. Accuracy is the most vital piece of tenant metering, so take the time to research the accuracy of any solution you’re considering! New construction vs. existing buildings. If you’re considering metering as your building is being built, you can easily have meters pre-installed in your distribution panels. If you’re looking to retrofit meters into an existing building, you’ll need to install meters in enclosures by the side of your distribution panels. Remember: some meters are better designed to be installed in existing buildings than others. Concentration of circuits. Many buildings simply don’t have a whole lot of space dedicated to utilities. Does your building have multiple electrical rooms, or are you working with very little space? What is the spread of your tenant loads? You’ll need to select a multi-circuit metering solution that fits into your available space while still being accurate and reliable. Indoor vs. outdoor. Where will your meters be installed? While some buildings may have space in an indoor electrical room, others may have to install meters outside. Outdoor meters are exposed to weather conditions, so you’ll need a solution that can withstand potentially harsh environments. Distance between meters and gateways. Your meters and gateways need to be able to communicate with one another, but the distance between them determines how that can be done. In most cases, wired connections can be installed. However, if the distance between meters and gateways is too far, wiring can become costly, making wireless communication between devices more feasible. Your unique installation needs will have a big impact on what type of metering solution you need, so take these factors into account and carefully consider them when you’re making your selection. If your meters are consistently measuring consumption data, but not reporting it to your software system, making data-driven decisions may be challenging. There are many different communication protocols available, such as BACnet, Modbus, and more—but it’s important to understand which protocol will work with your software system. Carefully select the right protocol to ensure your hardware and software are always able to communicate. You have a lot of options when considering a metering solution for your building, but it’s important to understand that not all solutions are equal. You need a system you can rely on, one that fits your building’s needs and helps you to accurately bill your tenants. Socomec’s wide range of metering solutions is designed to help building managers accurately and reliably measure tenants’ energy consumption and to use that data to bill tenants and, ultimately, reduce energy costs. 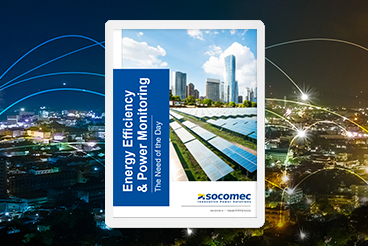 Download our latest ebook, Energy Efficiency & Power Monitoring: The Need of the Day, to learn more about how you can save energy and lower building costs through power monitoring.